Salesmen and saleswomen can never sell enough. The numbers that they have to make are always stretching them to reach beyond their grasp; and as such, maybe the least bit of an apparent downturn in sales is cause for consternation and a long face. Such was the sentiment hovering above the recent robot and automation show in Shanghai. The 20th China International Industry Fair 2018 (19-23 September) was a good place to see many long faces. …Lots of smiles as well. · Those nine venues cover the entire gamut of China’s reach for industrial dominance. And, quite naturally, AI has been added the overall mix as well. Gongkong, a Beijing consultancy, thinks that growth in the industrial automation industry is “notably slower” in 2018 than in 2017. Of course, it is. The blast off in China’s automation appetite in 2017 (See: Blast Off in 2017) was such an off-the-charts buying rampage that it’s difficult to forecast. Between 2011 and 2013, when China bought 6.6 gigatons of cement (more cement than the U.S. used in a hundred years), quarters where sales dipped by a skinny fraction were seen as catastrophic. China is a big place, and when it buys, it generally buys big. Robots are no different. Buying 13,000 industrial robots a month for 2017 (over 30 percent of the 387,000 world total), China needs time to receive and digest, and for vendors to destock. A much larger blast off than 2017 is looming on the horizon. Morgan Stanley’s conversations with industrial automation and industrial robot vendors at the expo revealed an anticipated “revenue slide in the rest of 2018, and that demand may recover in early 2019…the Gongkong expert agrees and thinks the recovery may not start until 2H19.” The 2H19 date aligns well with the original 2H17 blast off date. Spring is a great time for new offensives. Most notably, the ace in the hole for all automation and robot sales is the ready availability of government subsidies. Long faces at CIIF are temporary. The simple fact is that China’s central government is subsidizing the purchase of every robot, domestic or foreign made. That’s going to continue. Chinese government subsidies, after widespread delays in the first eight months of 2018, will return in 4Q18 and onward; the major change being a switch from central to local government control of these funds. Local governments will be launching their own “intelligent manufacturing business zones” and financing them directly, reports Morgan Stanley. For example, Guangdong provincial government offered $137 billion in subsidies between 2015 and 2018 to help local manufacturers automate. That’s enormous money. But, Guangdong’s GDP is $1.1 trillion! Robots and automation have already begun to increase productivity and GDP, which makes a lot of sense for a $137 billion investment. China is hell bent on increasing its robot density from 68 per 10,000 workers to 150 by 2020 (world leader, Korea, has 631 robots per 10,000 workers), so subsidies will continue. Notice that “millions of manufacturers” is very telling of the size of China’s manufacturing challenge for automation, most of which is far from complete. Especially so for the 250,000 state-owned enterprises (SOEs) and their 5 million workers. Foreign robot manufacturers—Japan, Korea, and Taiwan—will need to be aware of China’s domestic robot producers. The Chinese government’s plan is for 70 percent of the industrial robot supply to be built in China as of 2025. By then the country will have 1.8 million robots deployed—a tenfold increase over today—of which only 30 percent are native built. European builders with plants in China (KUKA and ABB) were much more confident at CIIF. Their machines are preferred for quality and durability by large Chinese manufacturers, especially the auto industry; and sales have been brisk. Morgan Stanley learned from industrial robot manufacturers that their management teams “think 3C and the packaging industry have significant upside for industrial robot penetration…[and that] more 3C parts suppliers and second-tier smartphone assembly factories are adopting more robots. With only 3,000 cobots sold in all of 2017, according to government sources, cobots will soon experience an unprecedented awakening in sales. Near totally overlooked in the blizzard of robot sales to date are specialized grippers or end-of-arm tools—the business end of every robot and cobot. China is basically unsophisticated as to the benefits of these high-end grippers, and as such, has opted for just about anything that’s priced right and works. Quality, like the Rolex of grippers, will have a profound effect on the quality of manufacturing; the advantages of which China is just beginning to notice. For all of those nervous sales order books at CIIF, places like Guangdong, Zhejiang and many others will make for a bonanza! It’s 769 miles south from Shanghai to Shunde, 906 miles if you’re driving, and a million miles from the glitter, crowds and endless rows of expo booths at CIIF. Shunde is what every tradeshows is all about: it’s where all the industrial robots and automation gear go to work. Shunde is where you can witness Made in China 2025 coming into being, and fully realize why Made in China 2025 is totally impossible without robot-driven automation. Shunde, a city within the city of Foshun (population 7 million), sits on the Shunde River that drains into the Pearl River Delta. Hong Kong and Shenzhen are close by to the south and Guangzhou just to the north. Thirty square miles of Shunde, about the size of Disney World, is under construction to build a $1.5 billion high-tech industrial estate. The builders and occupants: Midea, the mega-size electrical appliance manufacturer (20 factories, 250 warehouses and 100,000 employees) together with its 2016 $5 billion acquisition, KUKA, world’s sixth largest robot producer. 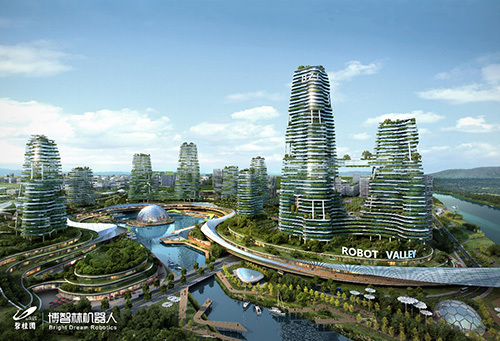 The pair will build out three new ventures on the property, one of which is very telling about the future of robots in China. KUKA’s directing the production of a new complex for building robots; annual output is scheduled to be 75,000 industrial robots by 2024. That garish number bears repeating: 75,000 per year! Just a few miles away, Jaten Robot & Automation has just opened a new factory of 430,000 square feet at a cost of $17.5 million. Jaten, a maker of AVGs, is expected to triple its current annual production to 10,000 robots. (See: Jaten video (South China Morning Press)). As Chen Hongbo, a Jaten VP, flatly puts it: “It’s an irreversible trend to replace human labor with robots.” As such, robot sales are irreversible. With all of this wild, hectic building going on in Shunde, it’s difficult to reconcile it with the jitters that were palpably evident at CIIF. Maybe there’s some wisdom for future robot and automation trade shows to pump in live video feeds from places like Shunde onto giant-size screens throughout every expo hall. In that way the enormity of what’s being built out, together with the attending sales opportunities, are never far from the purview of every attendee, especially those holding order books.